Addison, B.A. et al., 2008. Are yolk androgens adjusted to environmental conditions? A test in two seabirds that lay single-egg clutches. General and Comparative Endocrinology, 158, pp.5–9. Z. Benowitz-Fredericks, M., Shultz, M.T. & Kitaysky, A.S., 2008. Stress hormones suggest opposite trends of food availability for planktivorous and piscivorous seabirds in 2 years. Deep-Sea Research II, 55, pp.1868–1876. Bentzen, R.L. et al., 2008. Characterizing the nutritional strategy of incubating king eiders Somateria spectabilis in northern Alaska. Journal of Avian Biology, 39, pp.683–690. III, H.D.Douglas, Kitaysky, A.S. & Kitaiskaia, E.V., 2008. Seasonal covariation in progesterone and odorant emissions among breeding crested auklets (Aethia cristatella). Hormones and Behavior, 54, pp.325–329. Shultz, M.Todd & Kitaysky, A.Stanislav, 2008. Spatial and temporal dynamics of corticosterone and corticosterone binding globulin are driven by environmental heterogeneity. General and Comparative Endocrinology, 155, pp.717–728. Takahashi, A. et al., 2008. Thick-billed murres use different diving behaviors in mixed and stratified waters. Deep-Sea Research II, 55, pp.1837–1845. Williams, C.T. et al., 2008. 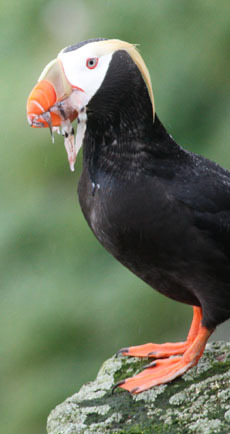 Corticosterone levels of tufted puffins vary with breeding stage, body condition index, and reproductive performance. General and Comparative Endocrinology, 158, pp.29–35. Williams, C.T., Kitaysky, A.S. & Buck, L.C., 2008. Food restricted Tufted Puffin (Fratercula cirrhata) nestlings increase vocal activity during handling without modulating total or free corticosterone. Journal of Ornithology, 149, pp.277–283. Benowitz-Fredericks, M.Z., Kitaysky, A.S. & Springer, A.M., 2006. Long-term Ecological Change in the Northern Gulf of Alaska. In R. B. Spies Elsevier, Oxford, pp. 94–112. Benowitz-Fredericks, Z.M., Kitaysky, A.S. & Thompson, C.W., 2006. Growth and allocation in captive common murre (uria aalge) chicks. The Auk, 123, pp.1–13.